So much for the campaign to Delete Facebook. Facebook (FB) reported Wednesday that it reversed its first ever decline in daily active users in the US and Canada during the first three months of 2018 despite the backlash from a massive data scandal. Facebook had 185 million daily users in the region as of the end of March, up from 184 million in the prior quarter. In total, Facebook added 48 million daily users globally during the quarter. Facebook now has 1.45 billion daily active users worldwide and 2.2 billion monthly users, both of which are up 13% year over year. The audience gains were revealed as part of Facebook's first earnings report since news of the Cambridge Analytica data scandal surfaced last month and upended the company, shaving tens of billions off its market value. Daniel Ives, an analyst with GBH Insights, said in an investor note Wednesday that the user figures were "a relief given fears of missing this number were running rampant." The stock rose as much as 7% in after hours trading Wednesday following the earnings release. "Despite facing important challenges, our community and business are off to a strong start in 2018," Mark Zuckerberg, Facebook's founder and CEO, said in a statement. On a conference call with analysts Wednesday, Zuckerberg stressed that he remains committed to the advertising business model that has powered Facebook so far even amid the data privacy backlash. "I know that a lot of people have had questions about the business model," Zuckerberg said. "We think that ads is a great business model that is aligned with our mission." Facebook posted nearly $12 billion in revenue for the first three months of 2018, up nearly 50% from the same period a year earlier, fueled by its ad sales strength on mobile products. The company also said it has approved a plan to boost its share buyback program by $9 billion. Facebook previously said it would repurchase $6 billion of stock. Heading into the earnings result, analysts were concerned about how much an ongoing backlash among users, advertisers and politicians on both sides of the Atlantic could slow down a company once viewed as unstoppable. Cambridge Analytica, a data firm with ties to President Donald Trump's campaign, accessed information from as many as 87 million Facebook users without their knowledge. The data debacle came to light late in the quarter, meaning the impact may be felt more in the quarters to come. Sheryl Sandberg, Facebook's COO, played down concerns about the impact of the data crisis on the company's core advertising business. She said Facebook had only heard from "a handful of advertisers" who paused their spending in the wake of the scandal, one of whom has since returned. There has not been a meaningful trend since, Sandberg added. The bigger concern may be negative impact from new privacy regulation, starting with a sweeping new data protection law set to take effect in Europe next month. David Wehner, Facebook's CFO, said Wednesday that the law, called the General Data Protection Regulation (GDPR), could cause user growth in Europe to stall or decline slightly quarter over quarter. There is also "certainly potential for some impact" to Facebook's ad revenue, Wehner said. But he said Facebook doesn't "really see a doomsday scenario here." The conference call offered analysts the first chance to grill Zuckerberg and his top execs. 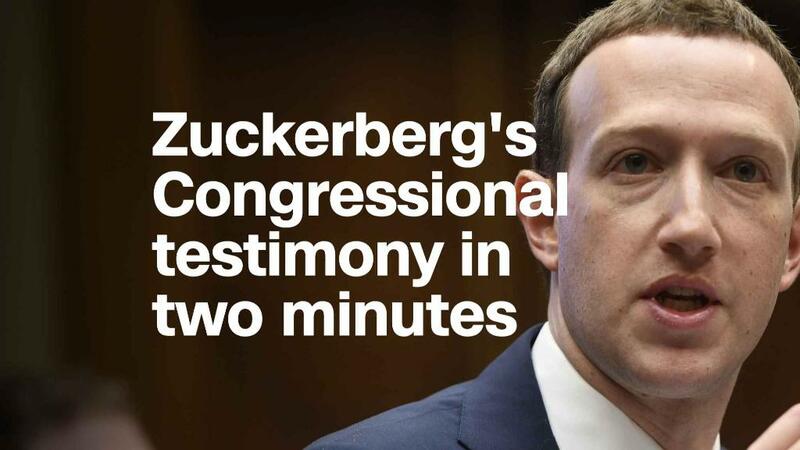 Zuckerberg previously testified for about 10 hours before Congress this month. "It was an important moment for the company to hear the feedback and to show what we're doing," Zuckerberg said of his first appearance on Capitol Hill. "Now, I think the important thing is that we execute on all the things we need to do to keep people safe."